Our annual Christmas festival and lighted Christmas parade is this week. I am so excited for this event, as each year the lighted floats just keep amazing me. Local folks and businesses enter some of the most beautiful floats I have ever seen, remember we are a small town, it’s pretty amazing to me. 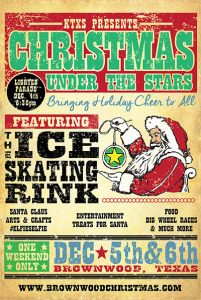 On Friday and Saturday evening, we have Christmas Under the Stars Festival at the Depot where non profits set up and have free things for the kids in the community to make and of course hot chocolate and funnel cakes. I take pride in this, as this is my area to bring together these folks under one roof and make it fun for the kids to see Santa, make gifts and have fun. We also have an Ice skating rink set up all week for families to come and enjoy, all be it not real ice, it still has the same fun effect. After all it is Texas, and keeping ice frozen on 80 degree days is bit of a challenge. It’s a lot of work putting that thing together, it is like a huge puzzle with interlocking parts. So, if you are in the area over the weekend, please come and enjoy some of these events. The Parade is at 6pm on Thursday4, 2014 and the Festival is Friday & Saturday from 4 to 8.